The Paw Print Genetics A locus (Agouti) coat color test evaluates the ASIP gene for the presence of the various agouti alleles, Ay, aw, at, and a. Genetic testing of the agouti coat color loci for the variants of the ASIP gene, Ay, aw, at, and a, will determine whether a dog is a genetic carrier of sable/fawn coat color (Ay/Ay, Ay/aw, Ay/at, or Ay/a), allows for agouti gene expression producing a "wolf" sable/gray coat color (aw/aw, aw/at, or aw/a), a black and tan, tricolor, or tan points coloration (at/at or at/a), or does not allow agouti gene expression producing a solid black or bicolor coat (a/a). This dog carries two copies of Ay which results in a sable/fawn coat color. However, this dog's coat color is also dependent on the E, K, and B genes. The sable/fawn coat color is only expressed if the dog is also E/E or E/e at the E locus and ky/ky at the K locus which allows for agouti gene expression. This dog will pass on Ay to 100% of its offspring. This dog carries one copy of Ay and one copy of aw which results in a sable/fawn coat color. However, this dog's coat color is also dependent on the E, K, and B genes. The sable/fawn coat color is only expressed if the dog is also E/E or E/e at the E locus and ky/ky at the K locus which allows for agouti gene expression. This dog will pass on Ay to 50% of its offspring and aw to 50% of its offspring. This dog carries one copy of Ay and one copy of at which results in a sable/fawn coat color. However, this dog's coat color is also dependent on the E, K, and B genes. The sable/fawn coat color is only expressed if the dog is also E/E or E/e at the E locus and ky/ky at the K locus which allows for agouti gene expression. This dog will pass on Ay to 50% of its offspring and at to 50% of its offspring. This dog carries one copy of Ay and one copy of a which results in a sable/fawn coat color. However, this dog's coat color is also dependent on the E, K, and B genes. The sable/fawn coat color is only expressed if the dog is also E/E or E/e at the E locus and ky/ky at the K locus which allows for agouti gene expression. This dog will pass on Ay to 50% of its offspring and a to 50% of its offspring. This dog carries two copies of aw which results in a "wolf" sable/gray coat color. However, this dog's coat color is also dependent on the E, K, and B genes. The "wolf" sable/gray coat color is only expressed if the dog is also E/E or E/e at the E locus and ky/ky at the K locus which allows for agouti gene expression. This dog will pass on aw to 100% of its offspring. This dog carries one copy of aw and one copy of at which results in a "wolf" sable/gray coat color. However, this dog's coat color is also dependent on the E, K, and B genes. The "wolf" sable/gray coat color is only expressed if the dog is also E/E or E/e at the E locus and ky/ky at the K locus which allows for agouti gene expression. This dog will pass on aw to 50% of its offspring and at to 50% of its offspring. This dog carries one copy of aw and one copy of a which results in a "wolf" sable/gray coat color. However, this dog's coat color is also dependent on the E, K, and B genes. The "wolf" sable/gray coat color is only expressed if the dog is also E/E or E/e at the E locus and ky/ky at the K locus which allows for agouti gene expression. This dog will pass on aw to 50% of its offspring and a to 50% of its offspring. This dog carries two copies of at which results in tan points and can also present as a black and tan or tricolor coat color. However, this dog's coat color is also dependent on the E, K, and B genes. The tan point coat color is only expressed if the dog is also E/E or E/e at the E locus and ky/ky at the K locus. This dog will pass on at to 100% of its offspring. This dog carries one copy of at and one copy of a which results in tan points and can also present as a black and tan or tricolor coat color. However, this dog's coat color is also dependent on the E, K, and B genes. The tan point coat color is only expressed if the dog is also E/E or E/e at the E locus and ky/ky at the K locus. This dog will pass on at to 50% of its offspring and a to 50% of its offspring. This dog carries two copies of a and will have a solid black or bicolor coat and no tan points. However, this dog's coat color is dependent on the E, K, and B genes. This dog will pass on a to 100% of its offspring. The Agouti Locus impacts canine coat color by regulating the temporal and spatial expression of the ASIP gene which when activated causes a switch from the synthesis of eumelanin (black pigment) to phaeomelanin (yellow/red pigment) in the melanocyte of the canine epidermis and hair follicles. The Ay variant of ASIP inhibits the MC1R gene (E locus) causing a switch from eumelanin to phaeomelanin production resulting in a sable/fawn coat color. The aw variant of ASIP produces a "wolf" sable/gray coat color. Other variations of ASIP, such as the at and a gene variants, impact canine coat color by producing tricolor/black and tan or bicolor/solid black coat colors, respectively. The variants of the ASIP gene are expressed in a hierarchical manner with Ay being dominant to and expressed over aw, aw being dominant to and expressed over at, and at being dominant to and expressed over a. However, the dog's coat color is also dependent on the dog's genotypes at the E, K, and B genes among others. The Paw Print Genetics A Locus (Agouti) coat color test evaluates the ASIP gene for the presence of the agouti Ay, aw, at, and a alleles. Located in the middle of the known canine coat color genetic interaction flowchart, the agouti (A) locus interacts closely with the E, K, and B genes to produce the dog's coat color and is only expressed if the dog is E/E or E/e at the E locus and ky/ky at the K locus. 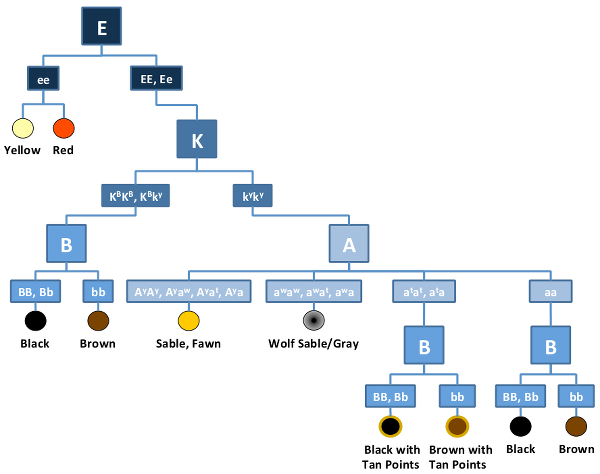 Genetic testing of the A locus for the Ay, aw, at, and a variants of the ASIP gene will determine whether a dog is a genetic Carrier of sable/fawn coat color (Ay/Ay, Ay/aw, Ay/at, or Ay/a), allows for agouti gene expression that results in a "wolf" sable/gray coat color (aw/aw, aw/at, or aw/a), a black and tan, tricolor, or tan points coloration (at/at or at/a), or does not allow agouti gene expression that produces a bicolor or solid black coat color (a/a).